Trail views like this only happen in paradise. 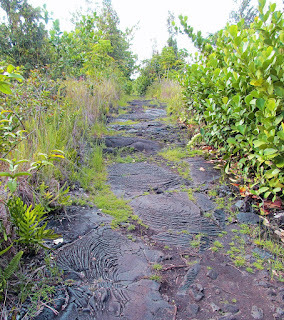 Hiking in the barefoot steps of the ancients today, I covered a short 1.7 mile section of one of the Big Island's four main prehistoric inland trails. 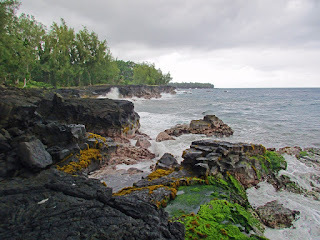 Cleared by the Polynesians and marked with large cairns whose constituent rocks now bear aged beards of lichen, these trails were shortcuts across the island's interior, likely used for commerce and access to hunting grounds and ceremonial sites. The preserved piece of trail I hiked is at 5000 feet elevation near the Saddle Road. 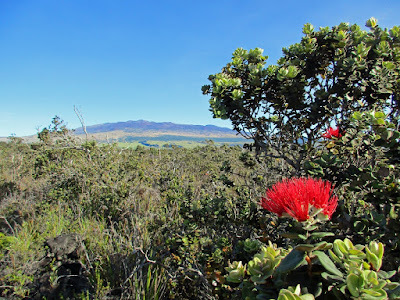 It was a glorious clear day there, unlike the day I hiked the nearby Pu'u 'O'o Trail. 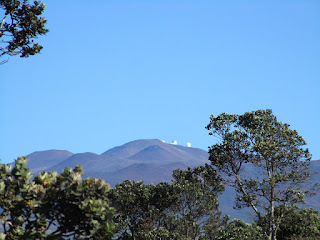 There were views of the ocean below (though hazy) and of the shimmering modern monuments of Mauna Kea - its telescope domes. 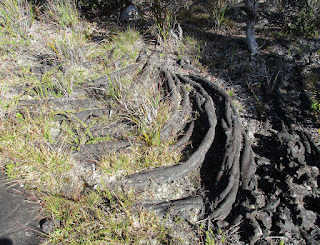 The trail bed is solid lava, of the smooth Pahoehoe type. But even pahoehoe can take a variety of forms. 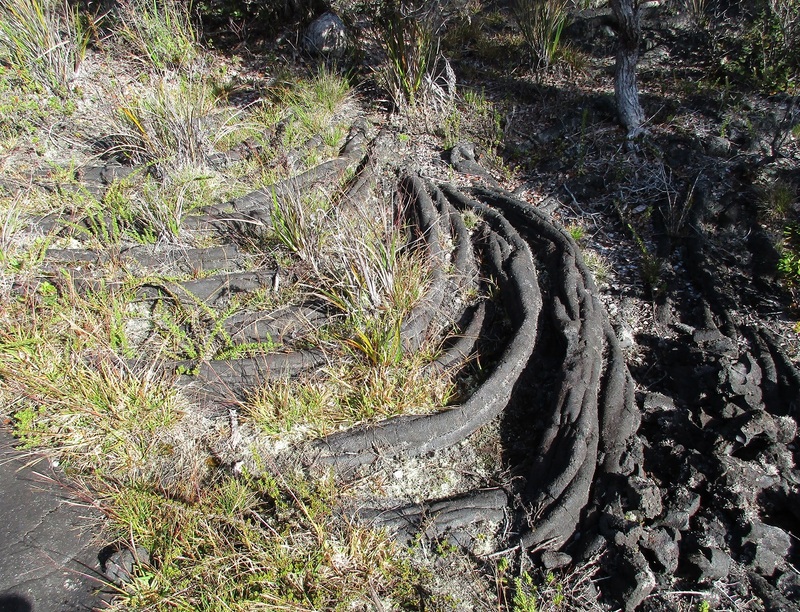 Here is a fine example of what's called "rope pahoehoe". Doing this 1.7 mile route even both ways left plenty of time for further hiking and exploration today. 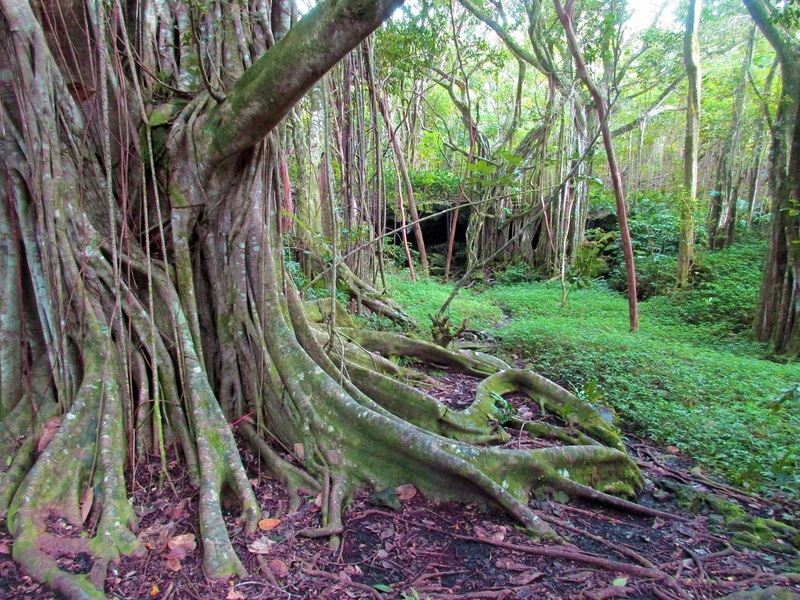 Next I headed up Mauna Kea, stopping along the road to snap a shot of another twisted old Mamane tree. 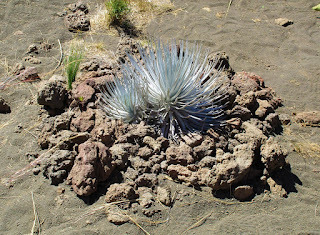 At the visitor center at 9200 feet I had a chance to visit half a dozen or so of just 1400 living specimens of the Critically Endangered Mauna Kea Silversword. 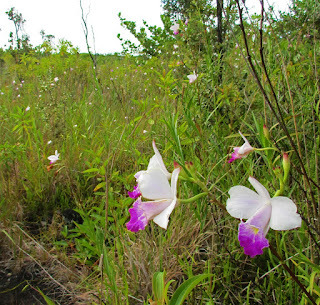 At one time about 40 years ago there were just a handful of known plants left in the wild. 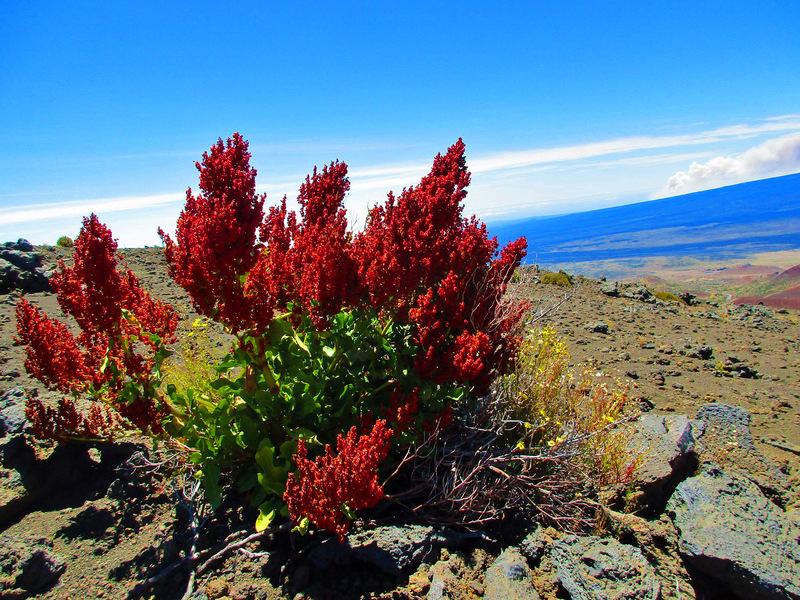 With the feral sheep and goats now being controlled and with an active hand-pollination and breeding program, this plant is making a comeback from the very brink of extinction. 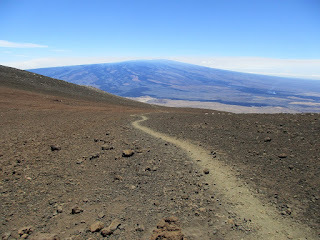 From the visitor center I took a training hike half way up to the summit of Mauna Kea and back. Views were stunning. On the horizon you can see a plume of smoke that I thought meant a serious new eruption event was taking place at the active volcano down on Kilauea. But it turns out that it was from a large brush fire still burning out of control 24 hours later. Above about 11,000 feet I saw no vegetation, not even a tiny sprig of grass or weed sheltered among the rocks. It is said that the silversword lived up here, but today the last substantial plant I saw provided a surprising splash of color at about 10,500 feet. 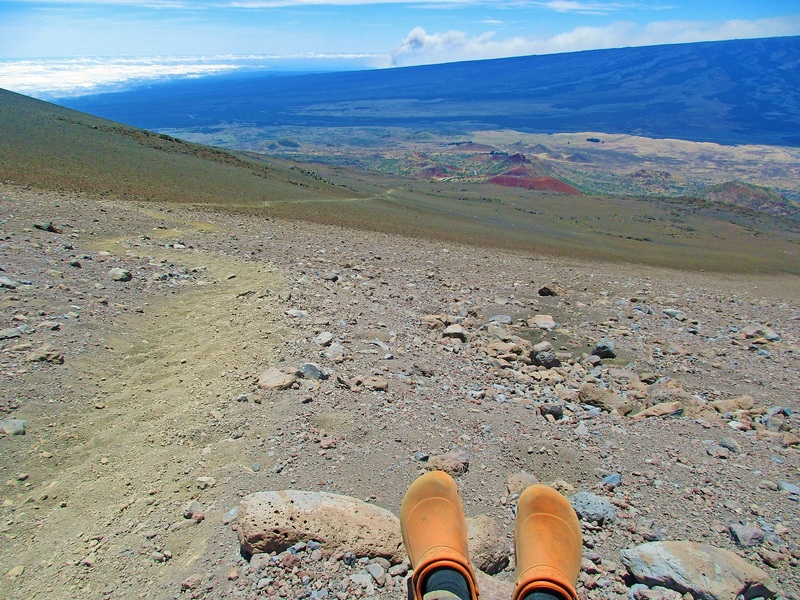 Otherwise the joy of this hike came from the sense of vast expanse. Here the trail seems headed straight for Mauna Loa. A visit to the Mauna Kea summit at sunrise or sunset is a must when you're on the Big Island. To get there, though, you have to have a four-wheel-drive vehicle or book a tour. What struck me most was when I looked *away* from the sun and saw the shadow of the entire mountain creeping across the haze and cloud over the Pacific. This view is reserved only for sunset. 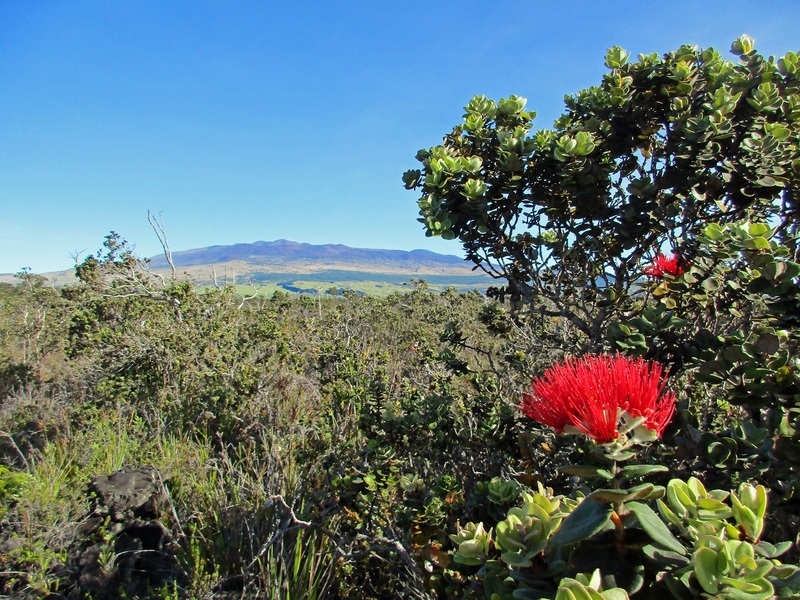 The mountain's high point, the actual summit cone, is the land seen to the right of its own shadow. 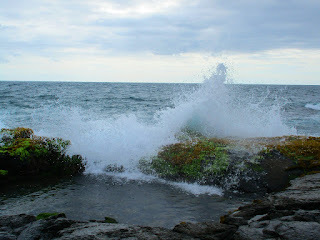 The previous day I hiked the eastern tip of the island at sea level. 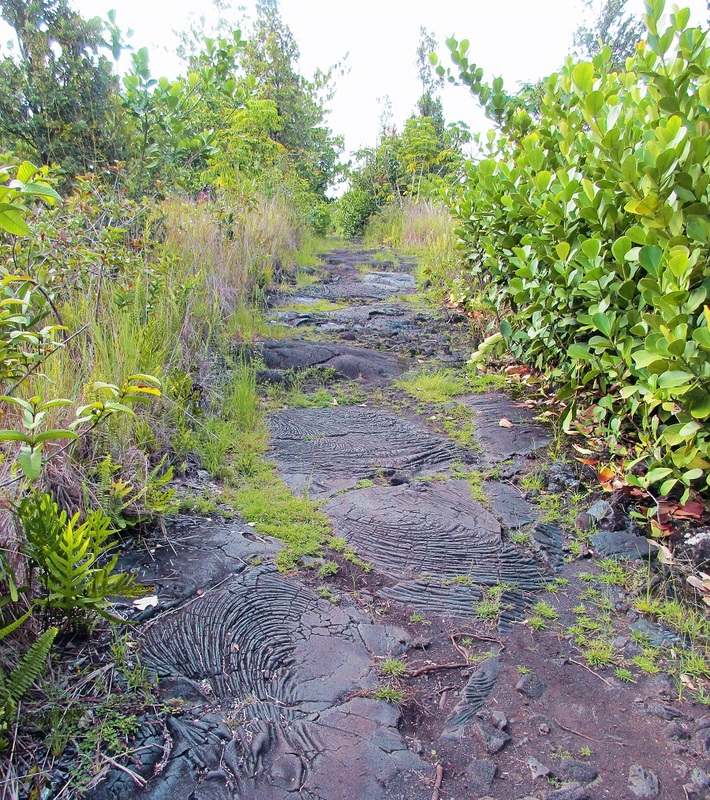 This is the 2.5 mile Puna Trail, part of an old government road built for horses in the 1800's. 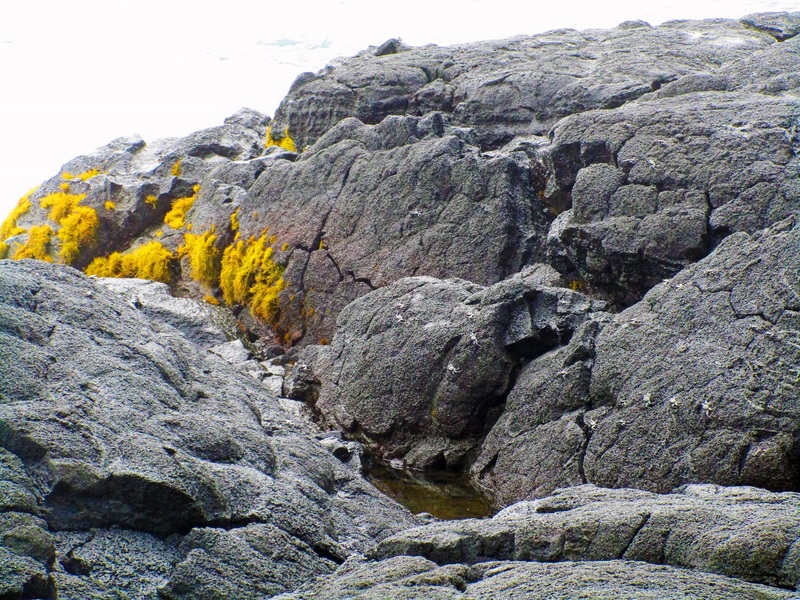 Like most of the island, its bed is made of solid pahoehoe. 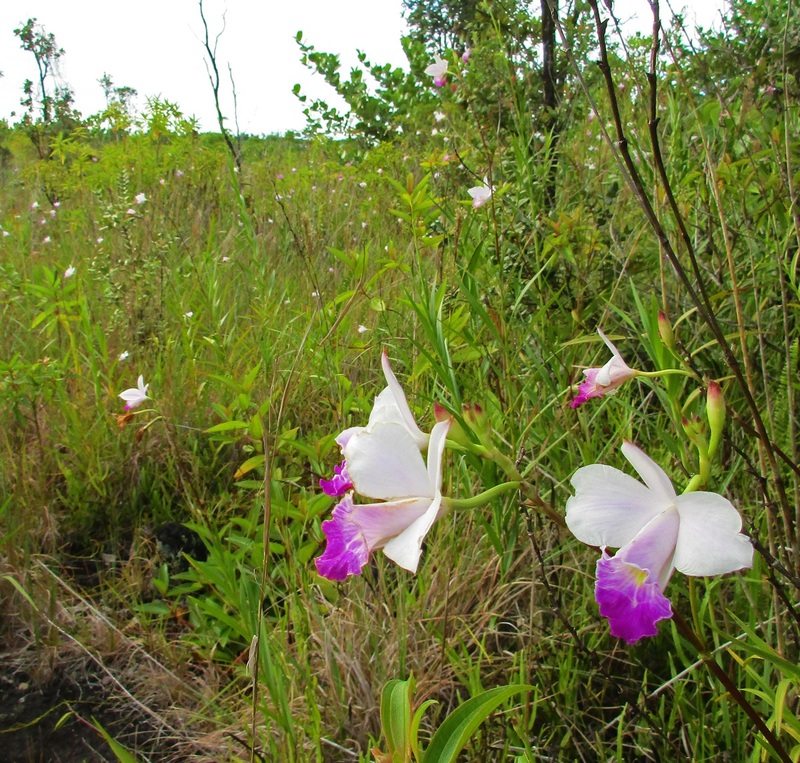 The trailhead is in an area spectacularly studded with wild orchids. 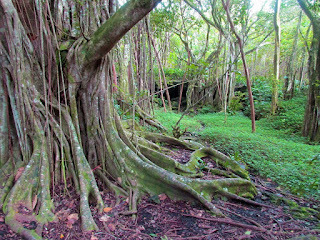 In the middle it is deep tropical rainforest, here seen as the setting for a small trail-side cave. And at the far end it comes out at a beach and homestead of major Island landowner W.H. Shipman. Here were waves crashing in from major Hurricane Hector, which is passing within a couple hundred miles of the island as I write this. The rock crabs don't seem to mind the pounding waves. 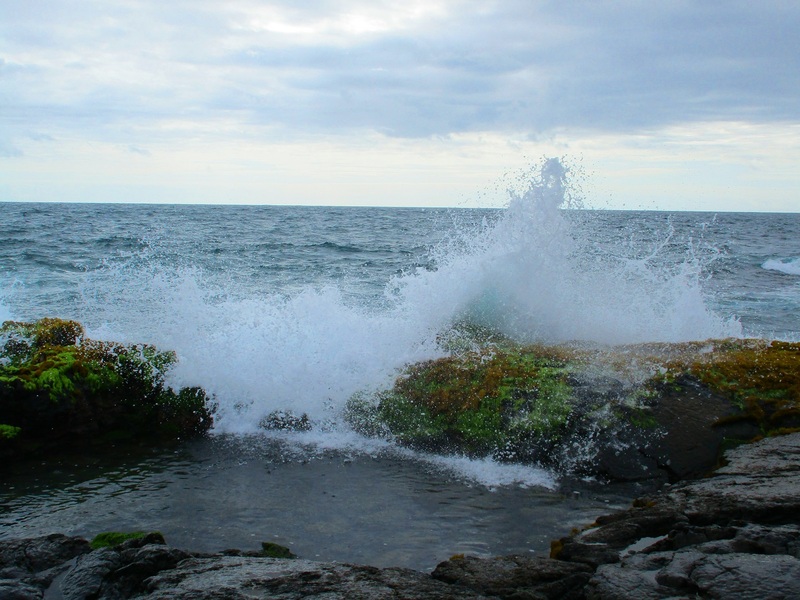 In fact they seem to thrive in this battering surf. At the Shipman homestead I had a chance to visit with another endangered endemic Hawaiian icon--the nene goose. This fellow is one of only about 2500 birds alive today. It was a rare honor. This land has been kept by the Shipmans as a nene sanctuary for nearly 100 years now. 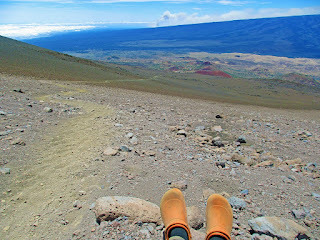 After the hike I drove through the heart of the eruption zone. Roads into the actual lava areas are closed with the National Guard manning roadblocks, but highway 130 crosses right over the East Rift Zone where the eruption split the earth wide open. The road is covered with steel plates over the new cracks, and there are signs warning drivers to roll up their windows and turn off vents and do not stop. 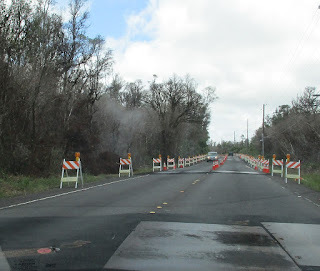 The smelly sulfurous steaming cracks leading straight to hell were fuming right beside the road. 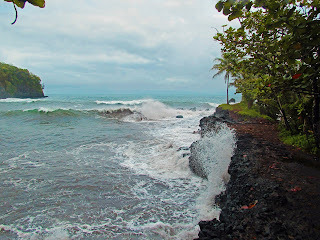 Later I made my last stop at my favorite place in the world to check out the roaring surf at the end of the Donkey Trail at Onomea Bay, just 6 miles north of Hilo. Hurricane Hector actually caused the wusses at Hawaii Tropical Botanical Garden to close for the day. What were they afraid of? The surf is probably worse in the winter. The wind was roaring along at maybe 2 miles per hour. The rain was steady but light. There are worse downpours here on most normal days. WTF HTBG? Probably just a lame excuse to take a day off.